I was 20 years old, and a newly-minted B.A., cocky, and full of self-importance an uncle of mine who was visiting us had offered to take me to a baithak to be given by Pandit Ramakrishna Vaze, whom people knew as Vaze-bua. As we were about to start, I innocently asked: "Mama, when do you think it will give over?" "To ask such a question is to show what a jungli you are: You go to a baithak as a devotee of classical music, a dardi not some goon who listens to bhajans and film songs on the radio, lolling in bed." That particular baithak did not end till the dawn hours. The Pandit took a long time to work himself into its resonance, and then he was in full flow, and I could see from the rapt expressions of my uncle and the other dardis, gave a great performance. Since then, I have learned to enjoy raga vocal music, but only of the canned variety. I never became a dardi. "I went to bed at midnight, but at 3 a.m. something unusual aroused me—the music became beautiful. (so) I rejoined the company (to find that most people) had gone off to their homes, and only a few experts survived.... I have no doubt that I was listening to great art." "Why save your best singers until 3 a.m.?" Forster asks, and I feel sure that my musical Mama, if he had been there, would have told him that it was just not done to ask such a question. Good music is for those who know good music—dardis. What is true of raga singing baithaks, or mehfils, must be also true of our Lok Sabha proceedings— at any rate on the evidence of the ‘No- Confidence’ motion debate in mid-August, 2003 which was shown live on the national TV channel. That debate was slotted to be over fairly early in the evening, say 6 pm. And it must be on that assumption that Ataljee, absolutely certain of a resounding ‘No’ vote, had invited his staunch supporters to a celebratory dinner at his house. That dinner had to wait till after midnight. As it happened, it was purely by chance that saw the show on TV— perhaps I’d punched the wrong button on the remote. And then I thought it was a football match I was watching, because of the sound effects. 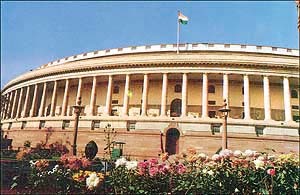 A constant buzz over which only loudly shouted words could be heard distinctly, but the images on the screen were not of ox-shouldered men in colourful jersies and shorts but of men and women dressed with everyday casualness seated on padded benches in a great hall, trying to listen to some one making a speech: The Lok Sabha is in session. In a football match, the background din, no matter how distracting, is easy to ignore; because of the action on the field; those muscular men showing off their skills that are priced in millions of dollars. Here there was no ‘action’ to speak of, only the sounds, the speechifying was all. And, for minutes on end, it was not possible to make out what was being said because several other people, too, were speaking at the same time in extra-loud voices, and only those who shouted loudest could be heard. Till the Speaker himself was successful in restoring order. And this was invariably done by the exercise of the utmost restraint, by gentle persuasion and mild admonitory warnings, the sternest of them being the threat of what they were saying ‘not going on record’ and, in extreme cases, blocking off their images from the TV coverage. "Order, order! Quiet please...please return to your seat...quiet!....quiet please!...." Whoever had heard of a football referee saying please while pulling up a player, even the Beckhams and the Ronaldos of the game? Any player who questioned a referee’s behest would be given a sharply worded warning and, if he persisted, the dreaded ‘yellow’ card. As in music, as in our being deeply religious and secular at the same time, this too, is ‘our’ way of the Parliamentary system; something that India has evolved for itself: a version that is less stiff, even free-and-easy dressed in kurta-pyjamas; casual, maybe; but informal, certainly; sturdy and high-spirited and, above all, functioning. Here were men and women from the far North or the deep South, with not even a common language other that English which most of them spoke after a fashion, subscribing to different faiths, engaged in a debate being shown ‘live’ to the public, seemingly roused to anger that was devoid of real hostility... and even when in full cry addressing their adversaries as bhai or behn. Just as our movies have evolved their own swing which has nothing to do with Hollywood norms, and gained acceptance as a different art form, so have we adapted the principle of free expression...and you can see it ‘live’ and judge for yourself how well it works. Even as that debate went on and on its vigour and noise-levels unabated, it brought into focus yet another agreeable feature of our political system. The importance that women hold in it. They’re not, as even in the most advanced democracies of the west, at its fringes, but at the very forefront. Not just also-ran members, but storm-troopers. They not only provided the patches of colour in that unrelieved drabness of white-on-white, of kurta-pyjamas or kurta-dhotis, they made lusty speeches full of sound and fury that were, on the whole, more spirited than those of their male counterparts. There was Italy’s or the Nehru family’s, gift to the Congress party, Sonia ji, in a glowing sari worn with ease and grace, tossing off parables from the Hindu epics or scriptures as any stalwart of the Hindi belt, in a voice that was as high-pitched as that of her role-model, Indira Gandhi. There, among the treasury front-rankers, Sushma Swaraj, serene, unflappable, given to jolly asides and vitriolic denunciations. There was Uma Bharati garbed in a flame-coloured gown of her own designing ready to exchange banter as well as fire and brimstone. There was Mamata Banerjee, benign or scowling. There was Vasundhara Raje, a daughter of one of the wealthiest princes, finding her working ground away from the family domain and championing the grievances of worn-torn dirt-farmers. There was Maneka Gandhi, a true disciple of St. Francis. of Assisi in her compassion for birds and animals, yet every bit as combative as her sister-in-law as a party warrior. Storm-troopers all, and it was easy, as one watched them ‘live’ fighting up for their causes and in full cry, to wonder, as William Blake did: Did He who made the lamb, make thee? and also whether, on a football field, some of their transgressions would have earned them a yellow card. But again, this, too is something to be thankful for—just another glimpse of the in-built strength of our political system.